Spring is approaching, the blossoms are appearing on the fruit trees and I have a few things to debut. First off, I've created a Scent of the Day (SOD) icon at right. Normally I don't wear much scent since I like my olfactory terrain to remain as clear as possible. However, lately I've been finding that I can't live without my solid perfumes. The first addiction began in August with Cimbalom, that lasted for almost six months. Then for about a week there I couldn't get enough of Lyra. As of late...it's been Chaparral®. Why is it that we crave certain scents at specific times? With botanical perfumes containing so much vital plant matter I can see why people turn to this media for perfume during challenging times. What I am curious about is why does one choose say Frankincense over Ylang Ylang or lavender? All three, based on scientific studies, help balance us emotionally. Chaparral® Solid contains quite a bit of Frankincense as well as many woods, resins and a few herbaceous notes. From a morphological point of view woods provide structure and support, resins heal and protect and leaves offer expansion. Ah-hah! Back to breathing in the aroma of the musky woods. 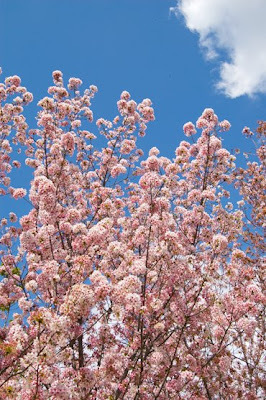 The photo of the Cherry Blossoms is ©Ben Neuhart, see more of his amazing work on his website.